Everything we ever wanted to know. Their romance is like something out of a fairy tale and as royal fans still ride the royal wedding wave, we're probably never come to terms with just how much Prince Harry completely and utterly adores his wife, Meghan Markle. From the sweet nothings he whispered to her all day, to the way he never stops doting on her - these two are rockstar royals head over heels in love. When the groom first lays eyes on his bride, it's always a very special moment. And when Prince Harry finally met Meghan Markle at the altar, Louise notes there was a sudden shift in the groom's stance. "This is a moment where the height of tension is palpable. Harry is so worried about Meghan," Louise says. "He tells he she looks amazing. He asks if she is OK. I think Harry worries himself sick about protecting her and that was his major focus," she adds. "He was adoring and focused and above all, admiring of her. He was not overcome by the moment - just focused on her and her well-being." Ever attentive, the groom asks Meghan if she is alright, a touching gesture which once again proves his protective streak. "I think he is projecting his love for his mother and concern for how she was treated onto Meghan. He is going to save Meghan at all costs," Louise tells us. The kiss is similar in body position, intimacy and love however the hands are different," Louise says. "Meghan and Harry are holding hands. Kate and William are separate." "For me, the critical thing was that Meghan appeared to turn to him and initiate that now was the time, ie she told him what to do!" 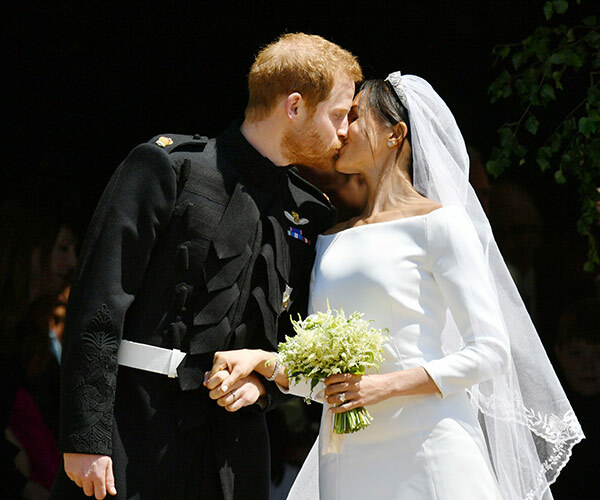 "Meghan and Harry's closed eyes, pressure on the lips and the length lingers for longer than William and Kate's but both are clearly couples in love. No question about that, as apposed to Di and Charles." Slide across to see the comparison! At 33 and 36 respectively, Prince Harry and Meghan Markle are years older than William and Kate when they wed. 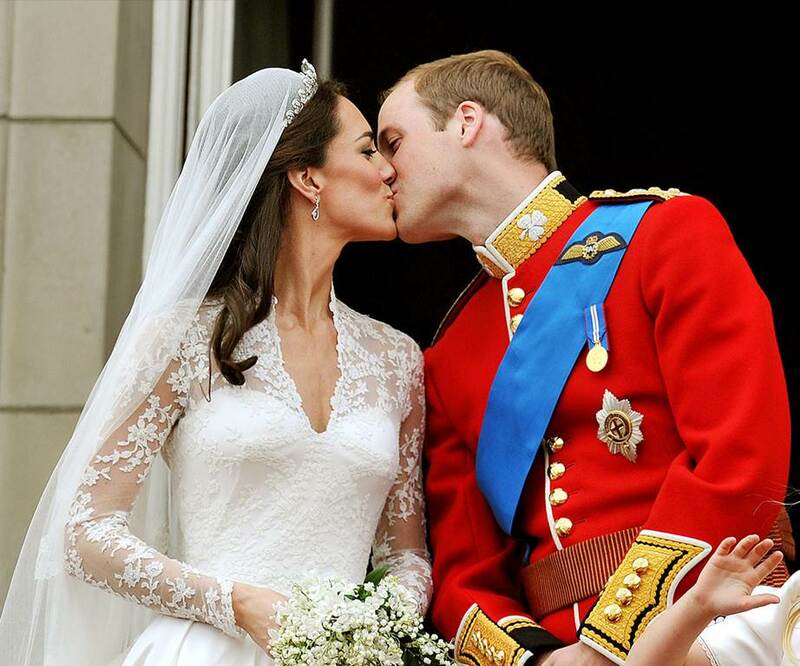 In 2011 when they married, William was 28 while Catherine was 29. According to Louise, the Cambridge's were a touch more nervous during their vows - and in fairness, Meghan is a professional actress and Harry has had years in the spotlight. "Kate had quite a high pitch voice and spoke softly. She had a very quiet and sharp appearance, looking away with pursed lips while William spoke with no smile. He was very serious and nervous." "Meghan and Harry both spoke incredibly assertively. Their on-set of sound was strong and clear, they spoke with a strong flow of air and intensity of gaze." Undeniably the stand-out star of the day, Doria Ragland was praised for sitting in the pews on the bride's side by herself. After Thomas Markle pulled out of the royal wedding, Doria was the only family member from Meghan's to attend the event and fans applauded the yoga instructor for her poised and independent stance, a symbol for single parents around the world. "Doria was a picture of grace and poise and everything any daughter could have hoped for in a mother. She was moved, but not too moved. She was alone, but never alone," Louise says. "Her breath remained low, her eyes remained soft an focused, her jaw was loose and she walked with grace." Another stoic and supportive figure was Prince Harry's father, Prince Charles. From walking Meghan Markle down the aisle, to welcoming Doria Ragland into the fold, Louise says this is "the new Prince Charles." "Charles's warmth for Meghan is palpable. He throws his body toward her, reaching out, warmly guiding her as he walks he down the aisle." "His downward look signals respect and his arm around her is caring." After the ceremony, Doria Ragland was escorted by Prince Charles to wave off her daughter and new son-in-law as they embarked on their carriage ride. In a very moving moment, she linked arms with Prince Charles. "He seemed genuinely welcoming and caring to Doria, what a change from what we saw at his wedding," Louise says. "His body is towards Camilla, but his elbow is open towards Doria not slammed in. His body posture is open and welcoming towards her, she's part of the team. He is open to her and breathing and relaxed." Watching Harry on his wedding day and it's easy to he's simply besotted by Meghan and extremely caring over her well-being. As Louise concludes, "Harry changes when he is with Meghan. He gets serious. It is not a case of not being infatuated or madly in love, he is." "He changes from being the joker with William, to being the protector with Meghan. He acts like her body guard and lover." "When he is with Meghan, he smiles less and instead of jokes we get sweet comments like 'Are you alright?'"